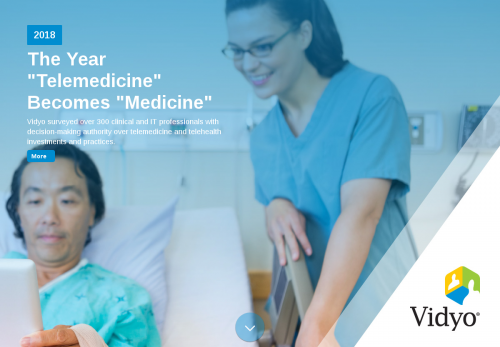 The Year "Telemedicine" Becomes "Medicine"
Vidyo surveyed over 300 clinical and IT professionals with decision-making authority over telemedicine and telehealth investments and practices. The survey focused on the use, and planned use, of telemedicine and telehealth technologies by healthcare delivery organizations (HDOs) in the U.S. and Canada. HDOs that expect to maximize positive patient outcomes must invest heavily in telemedicine, and more broadly in telehealth, and make it a fundamental part of delivering healthcare. There simply won’t be any distinction between “telemedicine” and “medicine,” or “telehealth” and “healthcare” for that matter, in the minds of either HDOs or their patients.